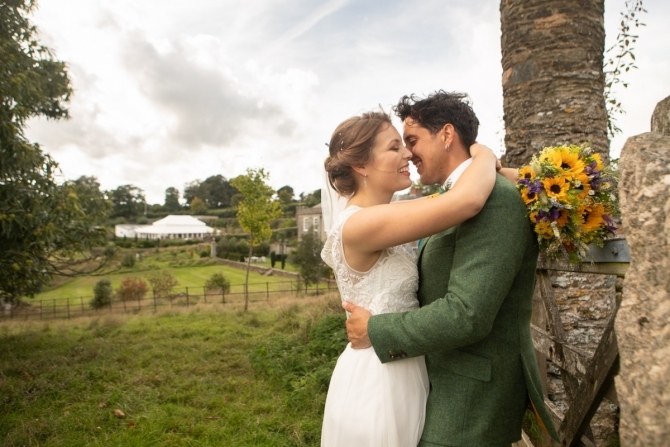 Thank you so much to the dream team that is the lovely Siddiqui couple, they really were amazing! Khalile and Tamsyn went above and beyond with nothing being too much to ask. 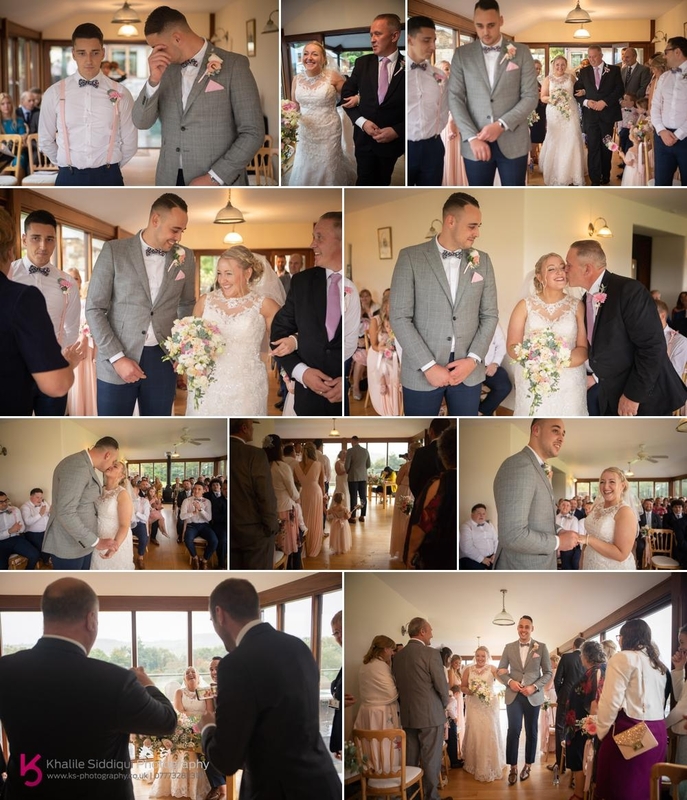 They are such friendly, fun and enthusiastic people who make a brilliant team and helped us to relax and enjoy our big day. 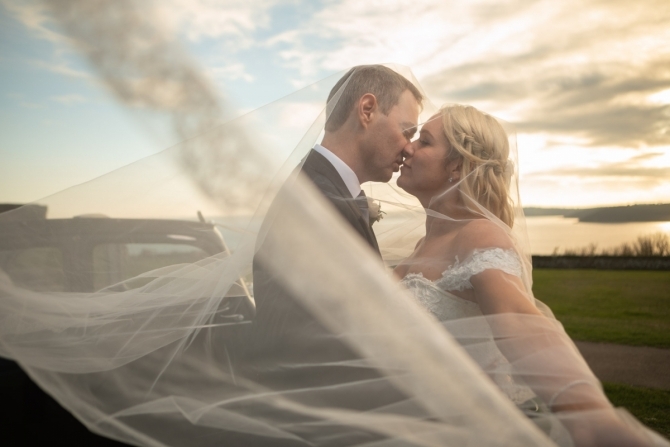 Khalile and Tamsyn captured the atmosphere of the day without us really noticing they were photographing and we are over the moon with the photos and service they provided. It was SO lovely getting to shoot Laura and Ben's Hendra Barns Wedding as Laura lives only two doors up from us and it seems SO long ago that Laura first spoke of getting married and she's been possibly the most excited bride I've every had the pleasure of photographing, and boy does she have stamina on the wedding planning front! 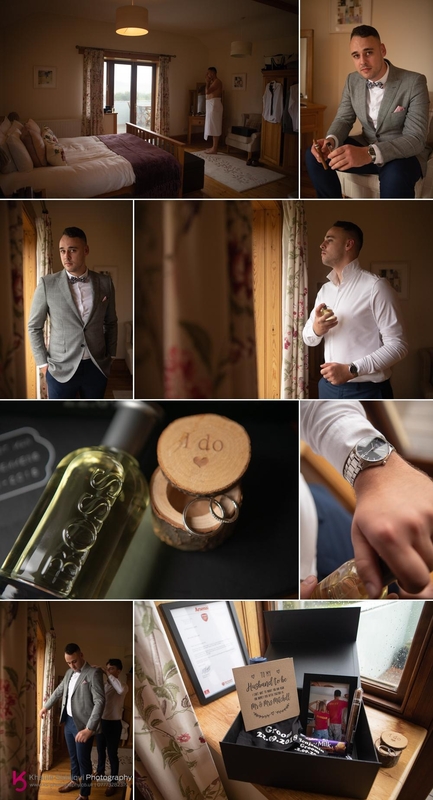 My day started with meeting Ben at Hendra Barns where he was getting ready with his best man Shaun. Bless him he was SO apprehensive, not because he was scared of getting married, but because he was SO worried about how everything was going to go, as he knew more than everyone just how much effort Laura had put into the design of their big day. It's been a long time since I've been to a wedding with this much styling and planning going into it. From the gift boxes that they'd bought each other, to all the thoughtful contents within them. 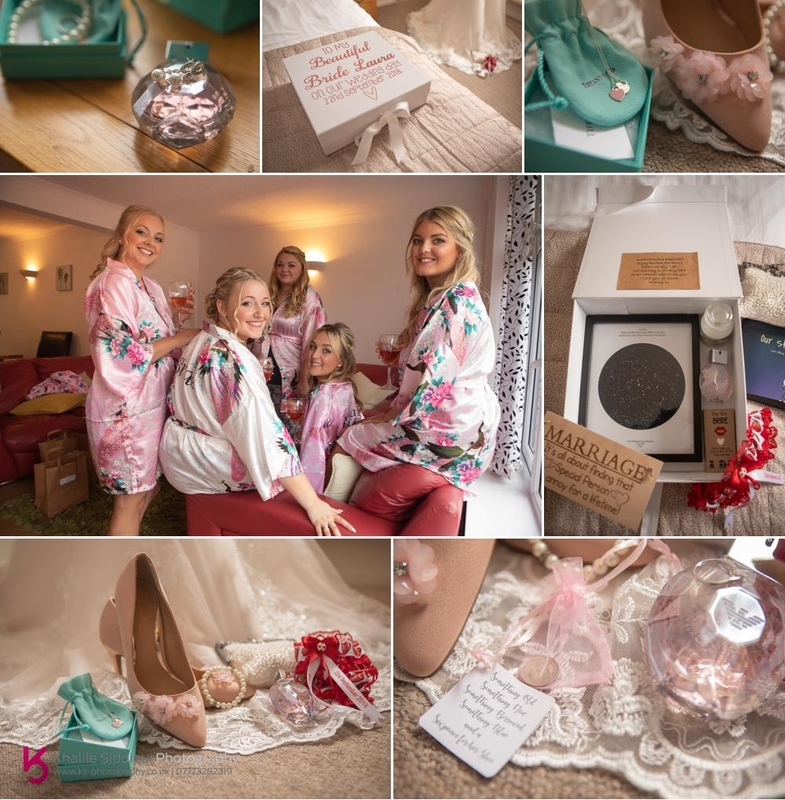 Such as all the personalised and thoughtful gifts, like the watch Laura had bought Ben, to the individually monogrammed boxes for all the six groomsmen. Laura even contacted Ben's beloved Arsenal Football club who sent a framed personal letter to the pair of them congratulating them and wishing them luck for the future. I don't think that there was one little detail that Laura hadn't thought long and hard over. 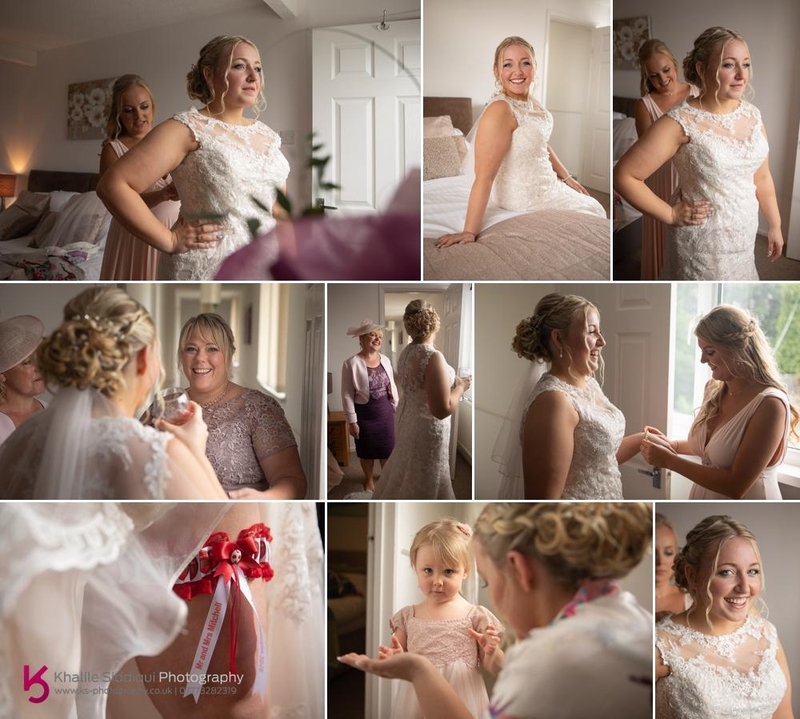 Despite Laura living two doors away from us she got ready at Bridge House which is in our village of Goonhavern, owned by family friends as it had more space for all the bridesmaids and family who were staying there. On arrival at Bridge House I had a bit of a surreal moment. Before I arrived Laura had a knock on the door and on opening it there stood a white haired man with a camera bag on his shoulder asking to come in, Laura obviously asked who he was to which he replied "I'm your photographer". "NO YOU AREN'T!" replied Laura. It turned out that there was another bride getting married across the road and just by chance he knocked on the wrong door. He was still in the front drive when I arrived and also by chance it turned out that he was Terry who photographed Tamsyn and I's wedding nineteen years ago, and that this was to be his final wedding before he emigrated to Spain (Best of luck Terry). Anyway, on entry to the house my beautiful wife Tamsyn who also second shoots for me was busy with her primary business of makeup and beauty styling Laura and the girls. Our brides love the facility Tamsyn gives of makeup freshen ups and a change of look for the evening being as she's around all day on the wedding day. But she wasn't getting the girls looking great on her own, she was joined by 'Lisa Poole' who was styling the girls hair. On arrival at Bridge House I went upstairs to photograph Laura's little details and saw Ben wasn't the only one with Arsenal memorabilia, Laura also had an Arsenal garter to put a smile on Ben's face (a loving wife indeed!!!). But Ben wasn't going to be left out on the detailing front, he too had a box made up for Laura with thoughtful gifts in, such as a framed star consolation of the day they met, and also a very personal printed book all about 'Laura & Ben'! 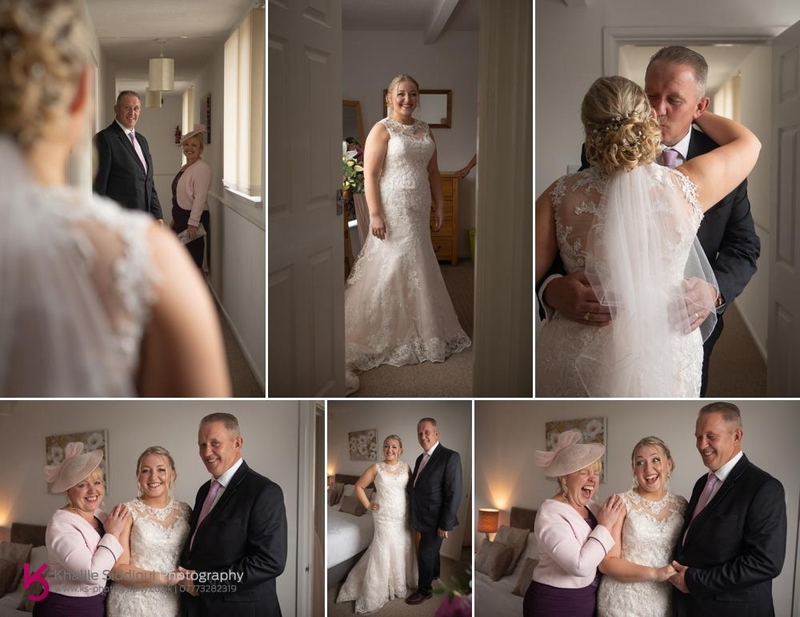 Laura's parents Jackie and Paul live very close to us too, and we've known them almost as long as Laura and Ben, so I was doubly excited for the moment when Paul got to see his little girl for the first time in her wedding dress (Such a lovely couple too! Laura has great mentors!). I drove Laura and three of her bridesmaids to Hendra Barns in our Mercedes to the waiting Ben and guests. 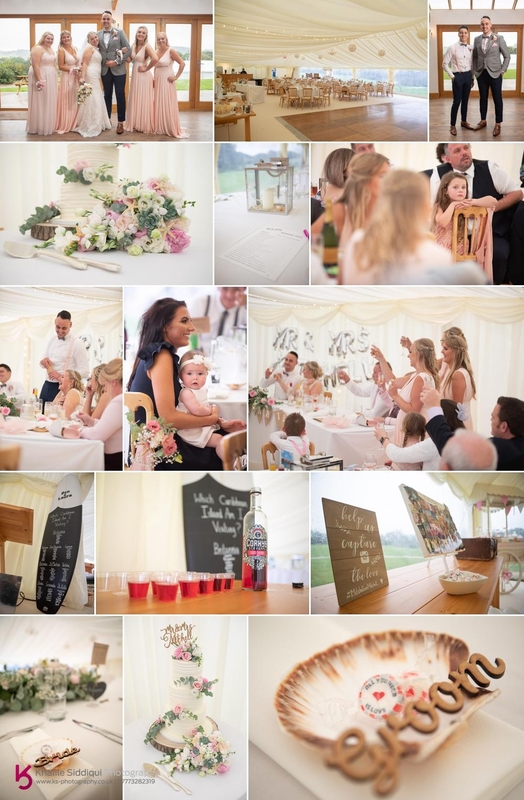 The ceremony was due to take place in the beautifully handmade wooden pavilion made by Ken who owns Hendra Barns, such a lovely man who can produce amazing things with his hands. But despite it being mid September the weather looked more like December, so the location was moved inside the large V-shaped garden room of the main house. I think this revised location was one of the main reasons why Ben was so apprehensive that morning, knowing just how much Laura had her heart set on getting married under the pavilion. 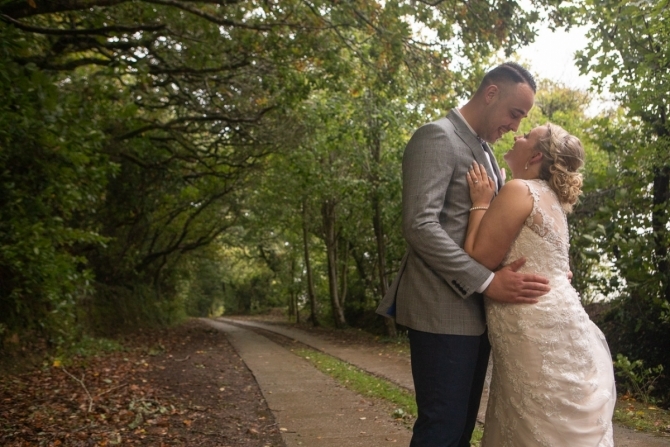 But once she'd arrived he knew the worry was for nothing, she was the most beaming bride with smiles from ear to ear and loved every minute of the day. At the end of the meal Laura and Ben held a quiz for each table, all about themselves, with prizes for the winners (More booze). 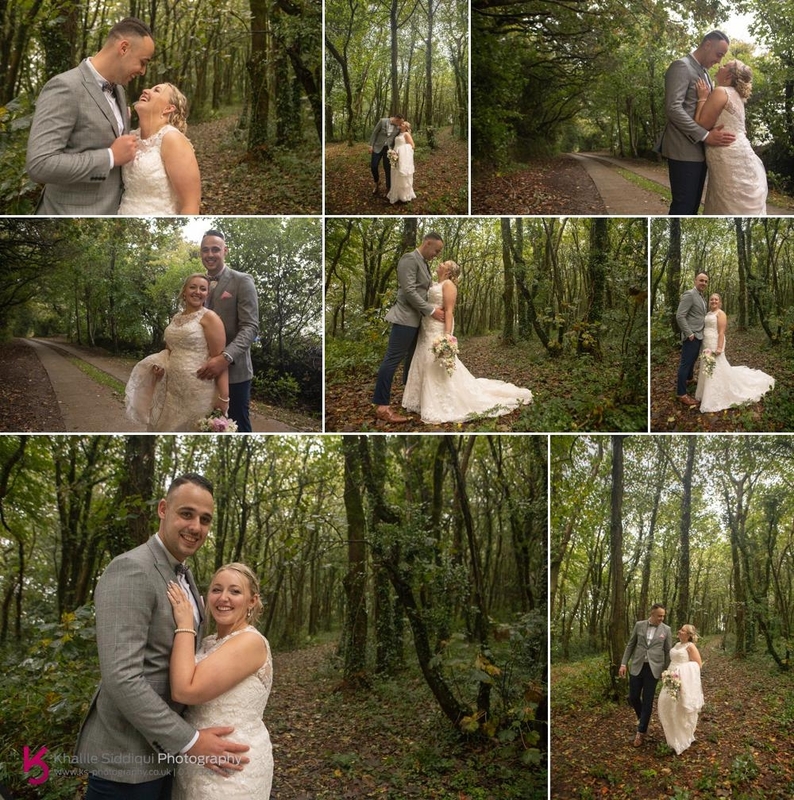 Then before the light went and while the drizzle wasn't too bad we took Laura and Ben off for some photos in the grounds of Hendra. 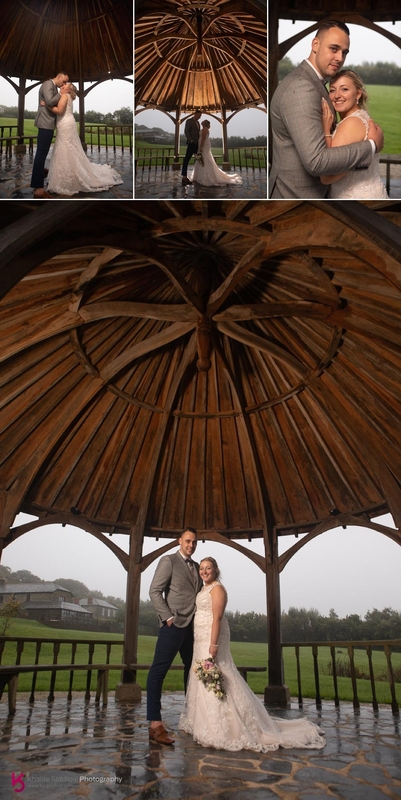 And then under the wooden pavilion that Laura had fallen in love with for their ceremony. 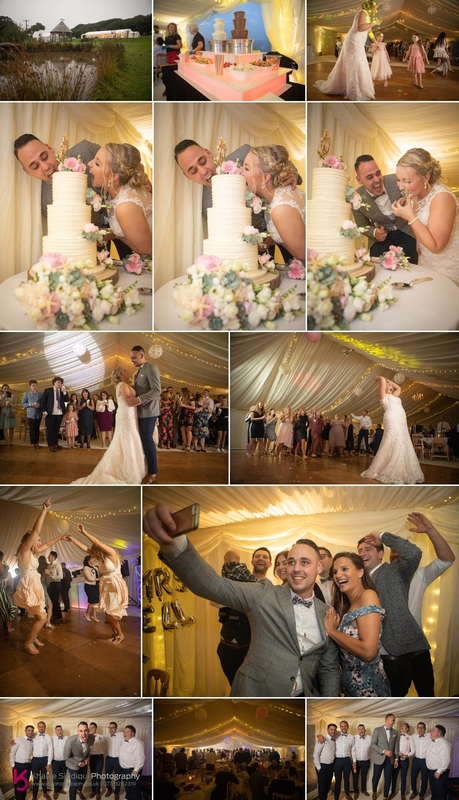 There was plenty of evening revelry to be had including the cake cutting (VERY funny moment), and chocolate fountain eating, supplied by 'Absolute Chocolate'. And to round the evening off Laura threw her bouquet to 'All the single ladies' which strangely enough got a bit boisterous. Dearest Laura and Ben, I know it wasn't quite how you pictured your wedding, but I very much doubt that you could have imagined any more laughs and loving moments than you received, you truly have such wonderful friends and family surrounding you, and I know that your life with be a happy loving one.